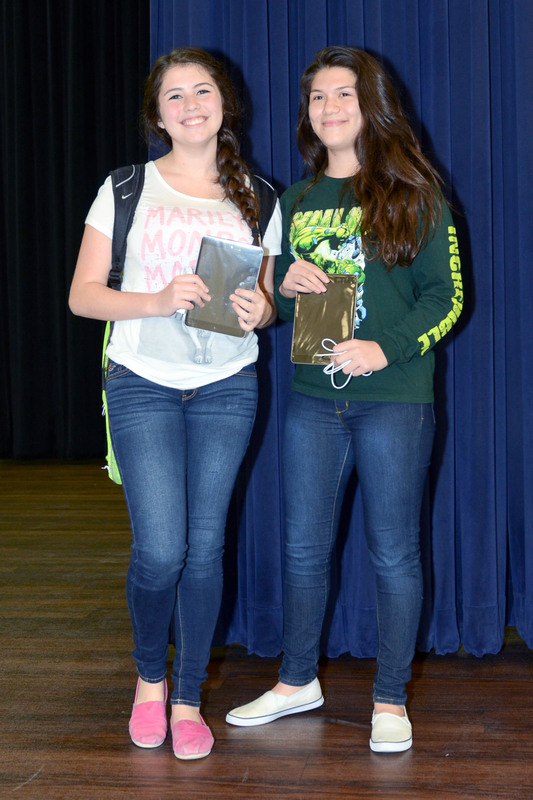 Vela students Austin Andablo and Alyssa Davila celebrate their selection as the winners of semester’s iPad minis in Nov.
Cano Freshman Academy students show off their prize from the campus’ quarterly perfect attendance ceremony. 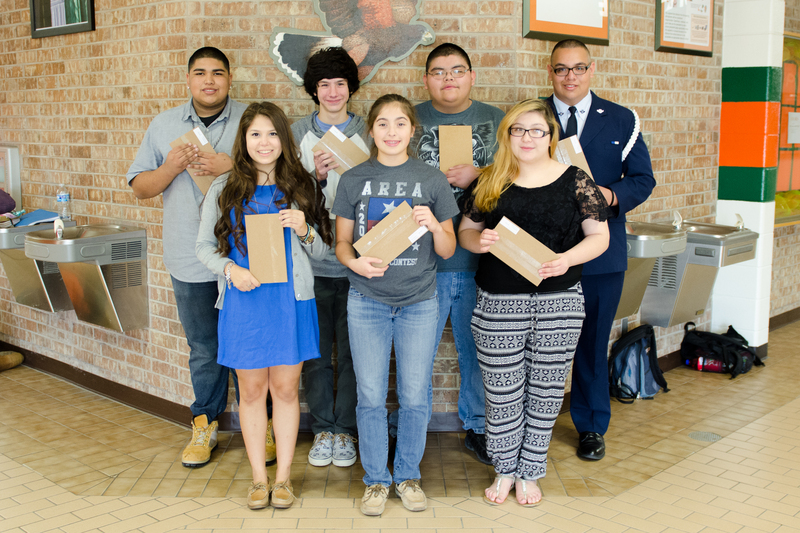 Arturo Calderas celebrates his selection as the winner of this semester’s iPad mini at Coakley. 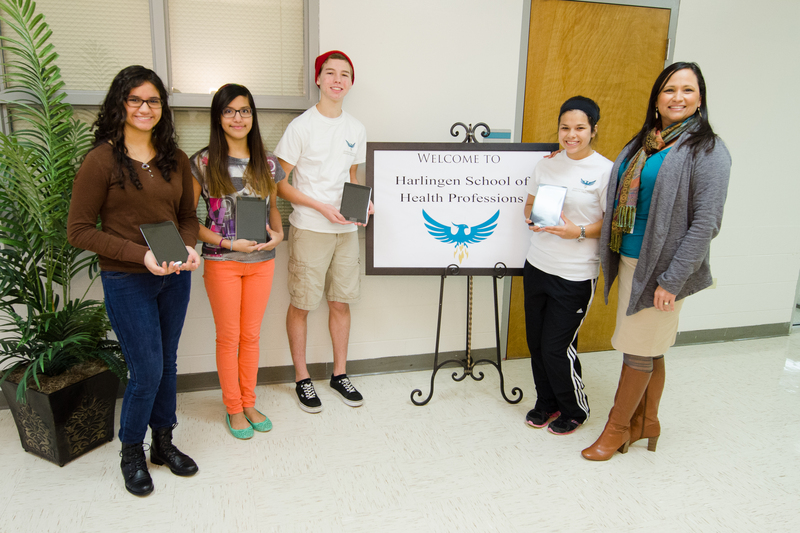 HHSS students show off their iPad minis after qualifying for the semester raffle for perfect attendance. 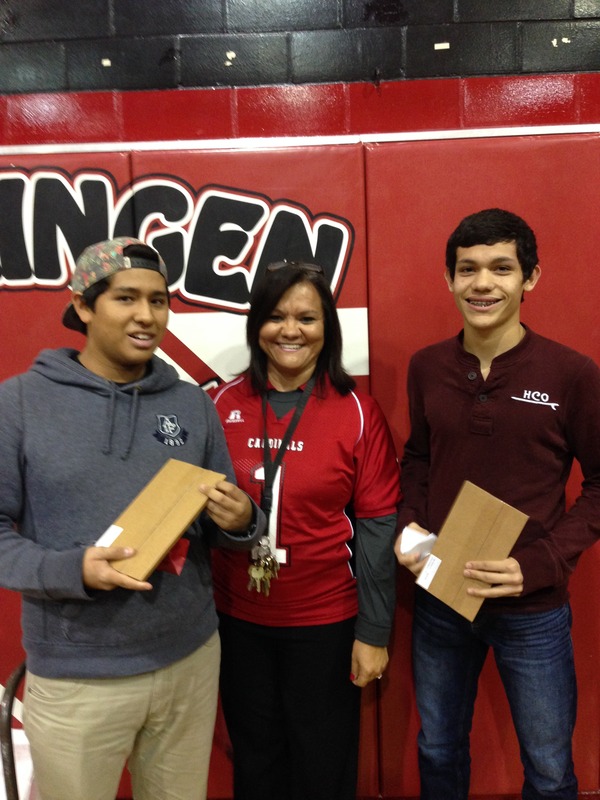 HHS students Matthew Gonzales and Cohen Reyes celebrate perfect attendance with iPad minis. Sitting in a cafeteria filled with his classmates, Vela Middle School student Austin Andablo stands up in disbelief when he hears his name called out during their quarterly attendance assembly. Disbelief turns into excitement as it sets in that he had been one of two students selected at this campus as the winners of an iPad mini. 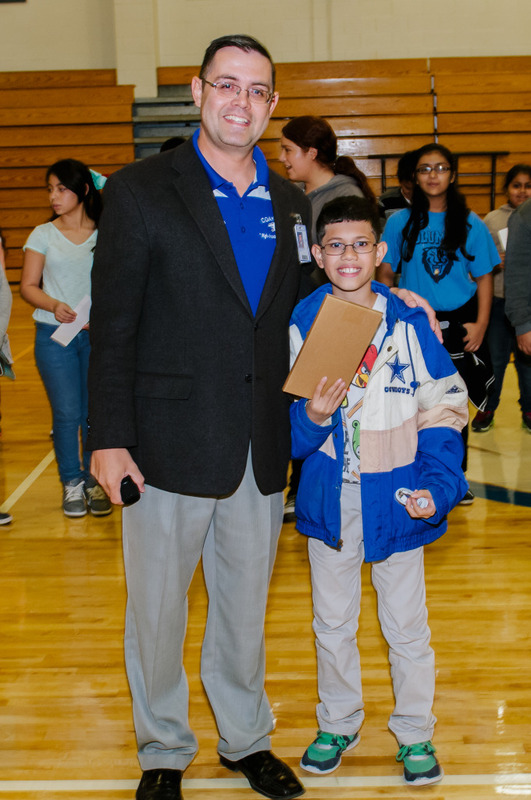 Andablo was one of 19 secondary school students in the Harlingen Consolidated Independent School District to win an iPad mini as a result of achieving perfect attendance in the first academic quarter through the Gillman Auto Group of the RGV Drive for Perfect Attendance Awards. This is the second year for the attendance incentive programs, whose goal is to improve student performance and increase average daily attendance by 50 students. Throughout the year, students will be placed in the running to win prizes for reaching attendance goals quarterly and/or yearly, and campuses will have the opportunity to earn cash prizes for campus-wide attendance performance. With his new device, he plans on using it help him with homework and research for school, he said. 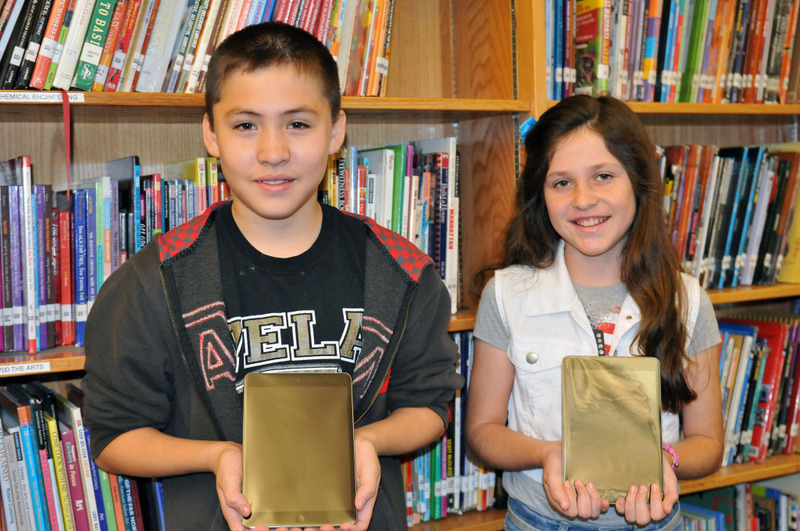 Fellow winner and Vela sixth grade student Alyssa Davila can also agree that the iPad mini will come in handy for classwork and helping her continue her quest for good grades. Both Andablo and Davila credit their parents with helping them make sure they made school a priority and attended classes each day. Along with the iPad minis and cash prizes for campuses, Gillman has provided a 2015 Chevy Sonic, as well as a 13” MacBook Pro, an iPad Mini, a Samsung Galaxy Tablet and 40 gift cards, totaling $20,000 in prizes for high school sophomores, juniors, and seniors. The grand prizes will be raffled off at the end of the year during a celebration hosted by Gillman, and students can enter the contest by maintaining perfect attendance throughout the year. Last school year, almost 200 students from 11th and 12th grade qualified for the final awards ceremony held on May 17. Complete rules for the program can be found at www.hcisd.org/driveforattendance.